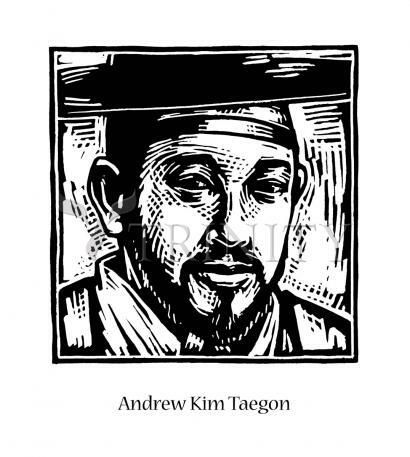 Andrew Kim Taegon's parents were Korean nobles who converted to Christianity. His father was also a martyr. After his baptism at age the age of 15, he attended the seminary in Macao, 1,300 miles from home. At his ordination, he became Korea's first native priest. Andrew Kim Taegon was the leader of the Martyrs of Korea, and the first priest to die for the faith in that land. "The Korean Church is unique because it was founded entirely by lay people. This fledgling Church, so young and yet so strong in faith, withstood wave after wave of fierce persecution. Thus, in less than a century, it could boast of 10,000 martyrs. The death of these martyrs became the leaven of the Church and led to today's splendid flowering of the Church in Korea. Even today their undying spirit sustains the Christians in the Church of silence in the north of this tragically divided land." —Saint John Paul II, speaking at the canonization. His feast day is September 20. Andrew was born of Korean nobility; his parents were converts, his father a martyr. Andrew was baptized at age 15, he then travelled 1,300 miles to the nearest seminary in Macao. He became Korea's first native priest, and the first priest to die for the faith in Korea. Andrew is a leader of the Martyrs of Korea. Saint John Paul II, during his trip to Korea, canonized these martyrs on May 6, 1984, and inserted their feast into the Calendar of the Universal Church.